Controlling Rat Dreams - Are You Next? 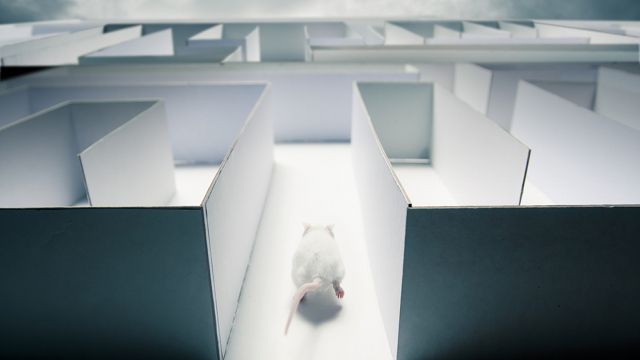 Researchers working at MIT have successfully manipulated the content of a rat's dream by replaying an audio cue that was associated with the previous day's events, namely running through a maze (what else). The breakthrough furthers our understanding of how memory gets consolidated during sleep — but it also holds potential for the prospect of "dream engineering." Working at MIT's Picower Institute for Learning and Memory, neuroscientist Matt Wilson was able to accomplish this feat by exploiting the way the brain's hippocampus encodes self-experienced events into memory. Scientists know that our hippocampus is busy at work replaying a number of the day's events while we sleep — a process that's crucial for memory consolidation. But what they did not know was whether or not these "replays" could be influenced by environmental cues.